I got up shortly after 7:00 and a few minutes later was back in the cafeteria for a buffet breakfast. Once again we got our money’s worth with a hearty breakfast to fuel us for the day. Our group was pretty upbeat at breakfast even though we knew the forecast called for a headwind all day. 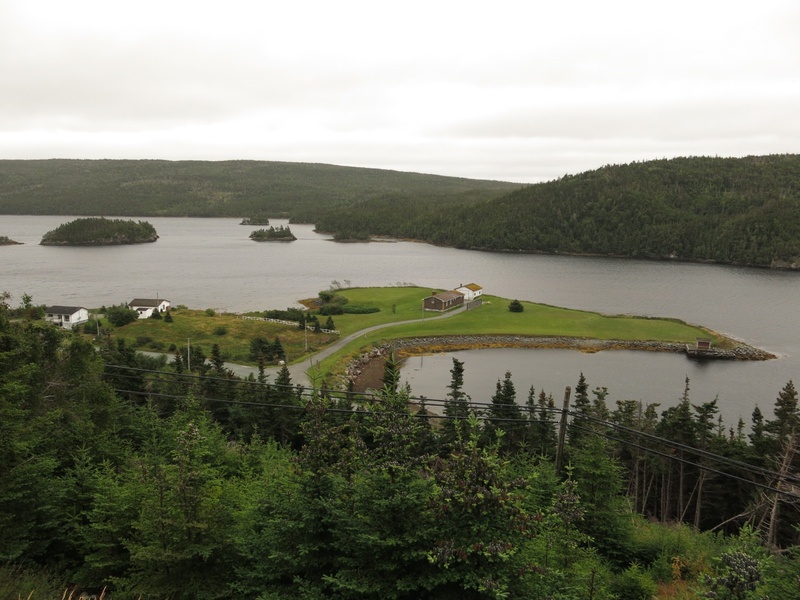 This would be our last day of riding – into St. John’s, up Signal Hill and we would be done! 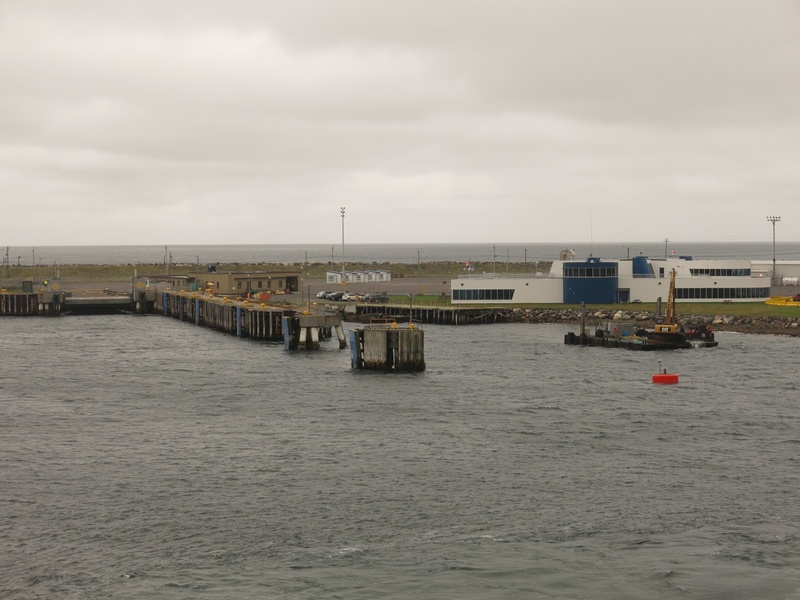 The ferry arrived at the dock in Argentia at 10:00 am. As walk-on passengers we had to wait until the vehicles had been offloaded so the shuttle bus could drive on to the ferry. As a result it was about 10:30 before I got to the van. The wind was pretty chilly and I hadn’t taken my rain gear on the ferry with me. So the first order of business was getting some warm outer gear on. 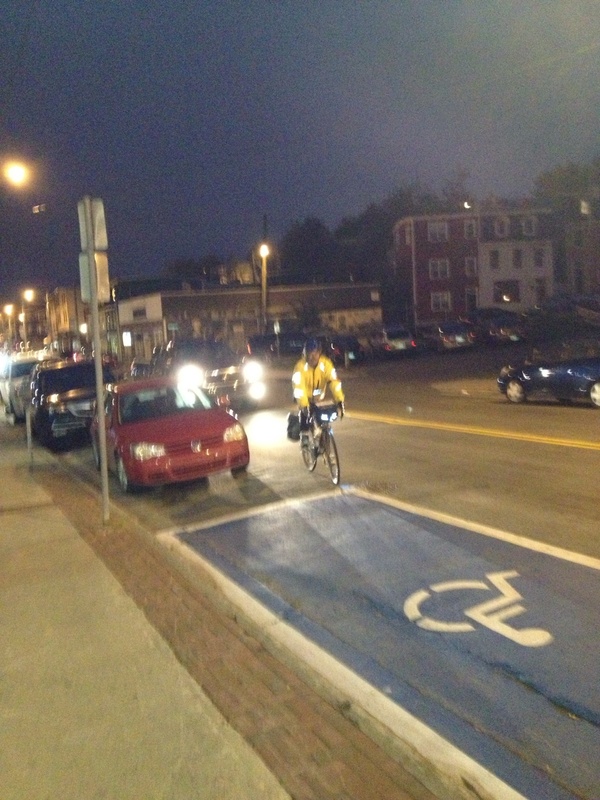 By then Adam was handing down my bike. I found my front wheel (which had been stored in the trailer), installed it, mounted my pannier and handlebar bag, filled my water bottles and was ready to go. Most of us had affixed purple and green ribbons to our bikes or to our helmets for this final day of riding in honor of Bob and Irene. The purple was for the purple top that Irene usually wore and green was for the color of the wrapping on Bob’s handlebars. Although they couldn’t be with us physically, Bob and Irene were in all of our hearts as we rode to St. John’s. As we left the ferry terminal we actually had a tailwind. For a moment Elaine and I had a fleeting hope that the forecast had been wrong and we would sail right into St. John’s. Within 500 m our hopes were dashed as the road changed direction and we were head on into 25 to 40 kmh winds. We took some solace in thinking that our ride would be 20 km shorter than the 140 shown on our map as last night Bud had showed us some shortcuts (as it turned out they only saved about 7 km). Our progress was very slow. There was a lot of climbing and even on steep downhill sections we had to keep pedaling or the wind would just slow us to a halt. After a couple of hours we hadn’t even done 30 km! The wind just never let up. 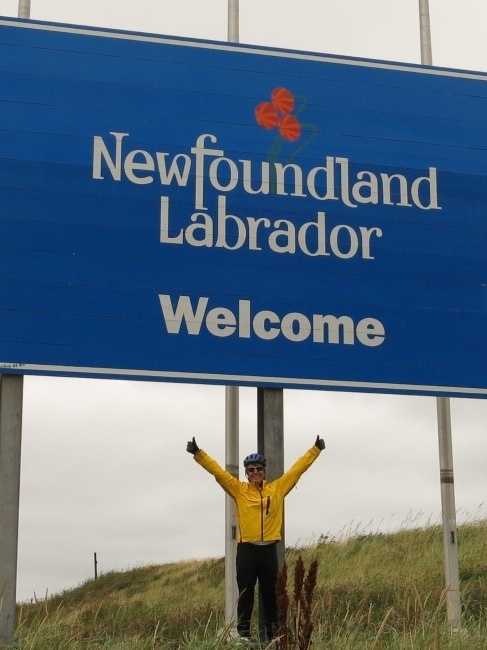 The original plan was for riders who wanted to ride up Signal Hill together to wait at a Tim Hortons on the outskirts of St. John’s for riders who were behind then leave together. We had set a time of 6 pm for departure from Tim’s. By early afternoon I knew that wasn’t going to happen. Optimistically I thought if we can make it there by 7 pm we could still make the final 11 km before dark. The first 45 km from the ferry were pretty desolate. There were few signs of civilization: basically just rocks and trees and hills and howling winds. At times the wind almost became deafening as you rode into it. There was no service station or cafe to stop at to get a hot drink. We stopped at the side of the road at one point to eat a PBJ. Once we got to the Trans Canada Highway there was a service station where we met up with Gee, Larry and Eric. A chocolate milk and a chocolate bar tasted pretty good. I texted Susan a couple of times on the ride with updates and tried to anticipate our arrival time at Signal Hill, which just kept getting later and later. As the day wore on the slow progress and the nonstop fight into the ever-present wind became disheartening. At the same time there was only one thing I wanted … to finish. After all this time and distance I knew my legs could do it. I just had to convince my mind that I could do it. All we could do is just keep plugging along, one kilometer at a time. We stopped at a service station one more time in Holyrood. After a drink and a chocolate bar we rode on. It was late in the afternoon when we rode through a construction zone, lifting our bikes over concrete barricades. 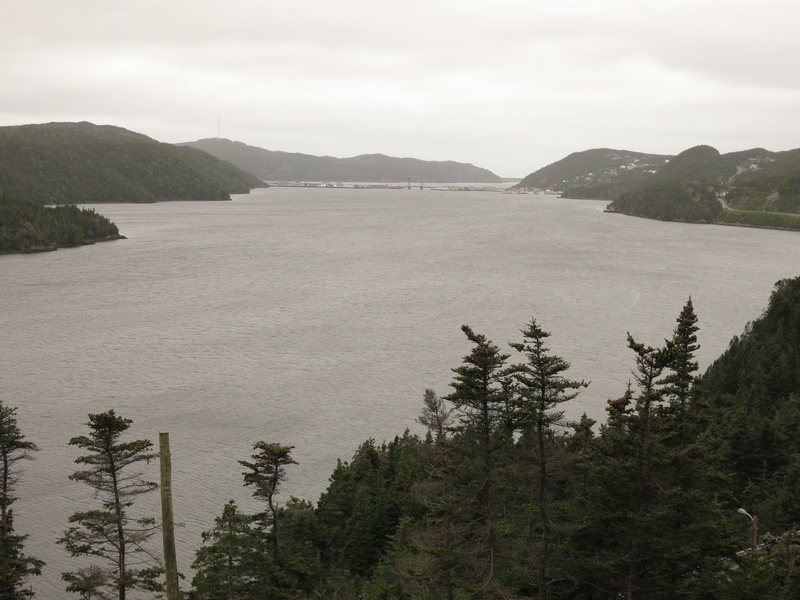 That got us onto Highway 2 for the last push into St. John’s, which also meant a lot more climbing as we came out of Conception Bay South. We turned off Highway 2 into Mount Pearl and soon came to the rendezvous point at the Tim Hortons. It was now 7:30 and getting dark. Elaine and I had both separately come to the conclusion that it was going to be too late to climb Signal Hill. At Tim’s we both expressed the decision to just ride to our respective hotels (most of the riders were staying at the Extended Stay Hotel but I had booked Susan and me into the Courtyard Marriott). Signal Hill would have to wait until tomorrow. None of the riders who were in front of us were at the Tims. I texted Louise and Myra who were in a group behind us, letting them know that we were carrying on. Then we continued on. By now it was pretty dark and we had to stop frequently under street lights to read the instructions on our day map. When we got to a street a few blocks from Elaine’s hotel she split off and I carried on towards mine, riding along Water Street. After a bit I figured I must be getting pretty close so phoned Susan to confirm the hotel was on Duckworth. Just as she answered I looked upwards and could see the hotel sign above me. One more climb up a short steep hill and I rolled into the hotel. The best sight of the day was Susan standing in front of the hotel waiting for me. My total distance for the day was 133 km. I was pretty much spent. Up in the room I ate the remaining half of the oatcake I had bought in North Sydney, had a shower, then we headed down to the lobby bar for some supper and a wonderful pint of beer. I was a little disappointed that we hadn’t made it up Signal Hill but at the same time realized that climbing in the dark and trying to take pictures at the top just didn’t make sense. It could wait until morning. Just the same the ride wasn’t officially over until we did climb the one last hill. After supper we returned to the room where I had no trouble falling asleep … in a real bed! Well done! Congratulations! Bravo! What an accomplishment! Thanks Paul. It’s been an incredible summer!